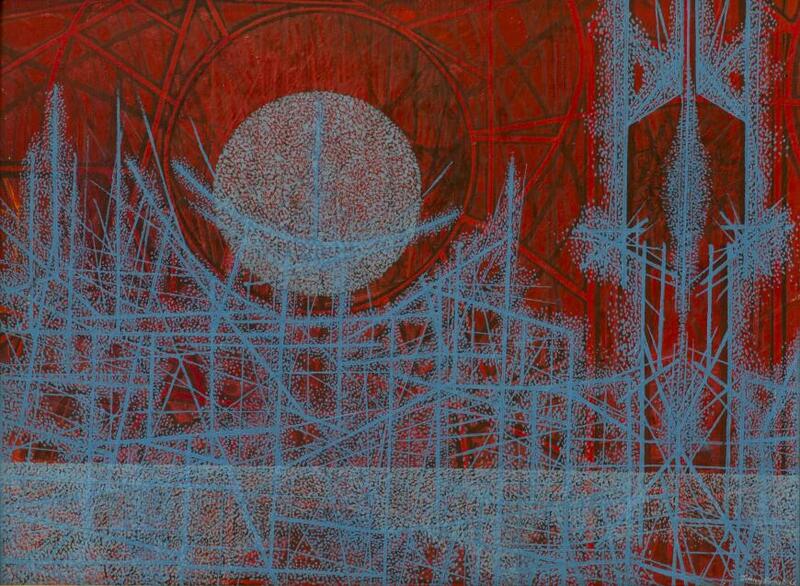 The son of the prominent Dada and Surrealist artist Max Ernst, Jimmy Ernst was born in Cologne, Germany. His parents separated early in his childhood, and Max left his wife and son for Paris. It was while visiting his father, however, that Jimmy Ernst would be exposed to such key players in the art world as Alberto Giacometti, Man Ray, Victor Brauner, Joan Miró, André Masson, René Clair, Yves Tanguy, and Salvador Dalí. Jimmy was privy to an exclusive screening of Buñel's film L'Âge d'Or, and his father provided his first exposure to American jazz. He closely observed his father at work in his studio. Jimmy Ernst's artistic revelation occurred when he saw Picasso's Guernica at the Paris World Exposition, and was inspired by its communicative power. He moved to New York on a sponsorship from the printmaker J.J. Augustin, who employed Ernst at the company's New York Branch. He would later work at the Film Library of the Museum of Modern Art and as the director of Peggy Guggenheim's Art of This Century Gallery before opening his own space, the Norlyst Gallery, in New York City. In his early work, Ernst was influenced by the physical, gestural act of painting as opposed to the theoretical discussions behind it. He spent time in Matta's studio studying automatism with Jackson Pollock, and found himself bound to a young group of New York artists by virtue of their mutual love of jazz. He remained involved with the New York avant-garde scene-despite a move to Sedona, Arizona, in 1944-and participated in "the Artists' Sessions at Studio 35" in 1950, joining the "Irascible Eighteen" in protest of the Metropolitan Museum of Art. In his later career he would see teaching positions at Pratt Institute and Brooklyn College, as well as a Carnegie Foundation Grant and John Simon Guggenheim Memorial Fellowship. Ernst continued to paint and exhibit widely until his death in 1984. Today, the Jimmy Ernst Award is presented annually in the artist's name by the American Academy of Arts and Letters. Abstract Composition is a forceful study in line and color. The linear dimension of his work creates a depth of field so vast that the painting seems to recede inward at the circle at its center; it creates a natural horizon line, making Abstract Composition appear a geometrically-rendered landscape or sunset. Ernst's painting, associated with both Surrealism and Abstract Expressionism, bears the hallmarks of both movements. Where precise line and geometry meet bold gesture, Ernst's work resides. 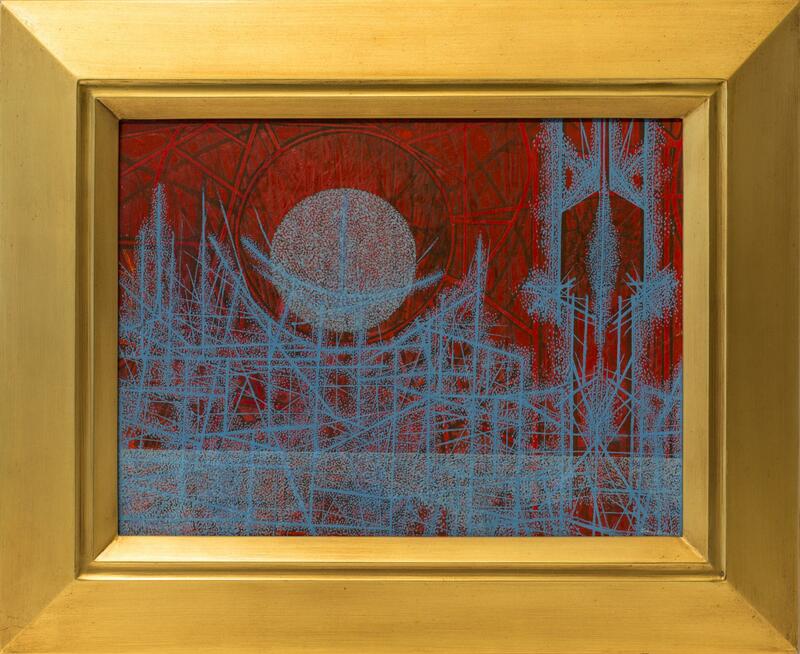 Abstract Composition, divided into hundreds of cells by the force of dark red lines and overlaid with a dreamy cerulean blue veil, is no exception. Ernst's good friend Kurt Vonnegut posited that the former's work was "executed so meticulously that the paint might have been laid on by a jeweler using a magnifying glass."